It’s been a grim five years for Carlton, with an average final ladder position of 16th since 2014. Ouch. They’ve won 26 matches in this period from a possible 110, and some people may feel that’s higher than what they thought. The biggest problem is that they’re still going backwards, with a paltry two wins in 2018. The Blues finished last season with a percentage of 59.3. To provide some context to this figure, the only clubs to record lower in the last 50 years are Fitzroy in their last two seasons back in 1995-96, expansion clubs Gold Coast in their first year (2011) and GWS in their first two years (2012-13), plus Melbourne under Mark Neeld in 2013 when he was sacked mid-season, arguably the most infamous coaching failure this century. It must be noted that Sam Docherty wasn’t considered for the squad, given the ACL injury he suffered in the pre-season. Gutting for player, club, supporters and even neutral fans, especially given it was his second in a row. Dale Thomas went to halfback in 2018 to cover for Docherty’s loss, and should do so again this year. Nic Newman has been acquired from Sydney to also provide run from defence, and the evergreen Kade Simpson goes on for a 17th season. Few players have more respect among the competition than he. Liam Jones has turned his career around with a solid year and a half in a key defensive post, where he can harness his marking skills in a way he wasn’t able to consistently as a forward. Jacob Weitering is seen to have plateaued after an exceptional first season, but at least the ill-conceived experiment of playing him as a forward appears over. Caleb Marchbank will be looking to take his game to another level down back, Tom Williamson showed promise in his debut year of 2017 before missing all of last season with injury and Lachie Plowman is also an option as a lock-down defender. Through the middle, Matt Kruezer needs to play a full season and provide his 2017 form if Carlton are to rise out of the bottom four. Patrick Cripps is an undeniable superstar, and has redefined beast mode when it comes to winning clearances. He never stops hunting the ball, and he added another weapon last year with his contested marking in front of goal when resting. He only kicked multiple goals twice though, and if he can lift that up to 6-8 times this year, he’ll go to another level again. Marc Murphy and Ed Curnow are the senior support staff to Cripps in the middle, and we know what we’re going to get frrom these veterans. Outside of these two, it is very much a midfield of the future. Sam Walsh is the number one draft pick, expected to play and have an impact immediately. The Blues traded up the draft to snare Liam Stocker, so particular interest will be taken in his progress. 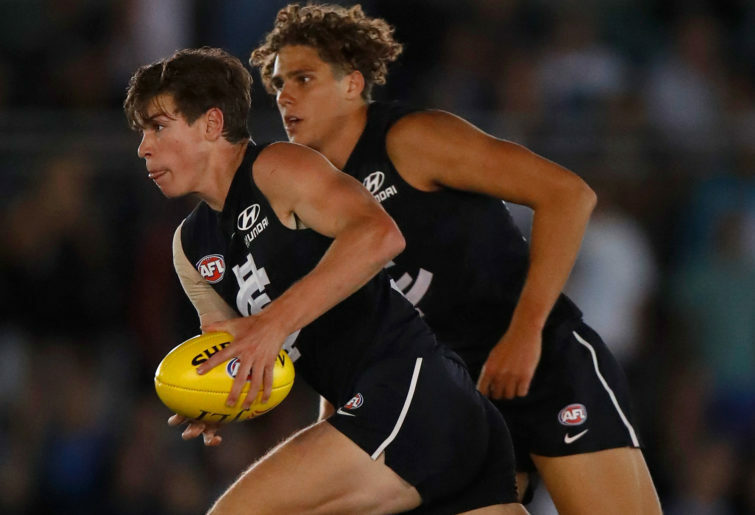 Paddy Dow and Lachie O’Brien, top ten picks from the 2017 draft, showed glimpses of the players they’ll become last year. Zac Fisher moves nicely, and with three pre-seasons under his belt is a hardy veteran compared to the others. Will Setterfield and Matt Kennedy are 21-year-old ex-Giants that much will be demanded of. It really is a brutally young midfield group. Much has been made of the fact that it’s been two and a half years since Carlton topped 100 points in a game, but they have added potency to their attack in the form of Mitch McGovern and to a lesser extent Alex Fasolo if he can stay fit and find his confidence. Charlie Curnow is the focal point of the attack and has all the tools to become the best player in the game at some stage. He could well find himself in the discussion for top 10 come season’s end. Along with Cripps, he is a franchise player to build an entire club around, not just a team. McGovern can prove a valuable partner to Curnow in a key forward post, even if both appeal as centre half-forwards rather than complementary targets. They’ll have to work well together to ensure enough space for the other. While McGovern hasn’t yet played 50 games, he is at least 24 and offers more experience than Harry McKay, who can continue to learn his craft as the third tall. It was hard for McGovern to be a dominant force at Adelaide in a forward-line of Walker, Lynch, Jenkins and Betts, and we should see his impact grow with more responsibility. Blues fans should be excited for the possibility of a forward-line where Curnow, McGovern and McKay all click, and they will trouble opposition defenders in the air. This is where they can get some wins. Crumbing forwards are an issue at the Blues. There is no Matthew Wright this year, who finished top two in their goal-kicking the three years he was on the list. Outside of him no smaller player kicked more than eight goals last season. Sam Petrevski-Seton could be a player to add some bite inside 50, but Brendon Bolton will surely want him around the ball a bit more. Jarrod Pickett and Jarrod Garlett haven’t looked up to it. Jack Silvagni moved to defence last season, and it’s hard to know where he is at. Carlton will need a lot to go right to make a jump up the ladder, even though the club is counting on one given they traded their first pick and will take Adelaide’s Round 1 pick to the draft. The worst case scenario is that Carlton wins the wooden spoon and Adelaide the premiership. But this is a club about the future. 12 of the best 22 named above come from the last four drafts, so the nucleus is there. And that doesn’t include Cripps and McGovern who are still only 24 and could well have eight-to-ten years ahead of them. Developing these young players on the training track is obviously critical, but so is the balance of getting them to learn on the field without burdening them with too much responsibility and either jilting their confidence or cooking them. It’s hard to be bullish on the Blues, as they are still taking baby steps due to list construction. The patience of fans is being tested. The rest of the football world barely remembers they exist.